Burj Khalifa scooped the top accolade at Cityscape Abu Dhabi, with judges praising the 828 meter tower in downtown Dubai as ‘truly iconic’. The Burj, designed by SOM architects for developers Emaar, won best mixed use category just weeks after re-opening to the public following problems with its lifts. As well as praising the world’s tallest tower, the judges also commended the development of downtown Dubai, which includes Dubai Mall and a range of commercial and residential units. “This development encompasses everything good in a mixed use development – a pleasant commercial working environment, a range of excellent hospitality venues, world class shopping and a beautiful residential integration,” they said. Meanwhile, Emaar received the Cityscape architecture award for Best Urban Design and Master Planning for their framework plan for the Eastern Harbor in Alexandria, Egypt. 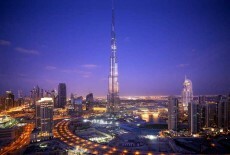 Judges praised Emaar for its “integrated and coordinated approach”. Previous articleHow the VVVIP party has been postponed AGAIN!